Styracosaurus was a herbivore (plant-eater) that lived in the late Cretaceous period, about 76 to 70 million years ago. It was about 18 feet (5.5 meters) long and weighed around 3 tons. The name Styracosaurus was chosen by Lawrence Lambe in 1913, and means "spiked lizard". This name was of course chosen in reference to the animal's most distinctive features: the horns around its neck frill, the smaller horns on its cheeks, and the large horn on its snout. Although it usually believed that Styracosaurus became extinct many millions of years ago, some cryptozoologists (people who search for rumored or mythical animals whose existence is uncertain) have suggested that an animal claimed to be living in Cameroon, which is known as "Ngoubou", might be a surviving ("relict") Styracosaurus. As yet however, there is no definitive proof of the existence of this animal. For more information see Living Dinosaurs? North American Dinosaurs - Styracosaurus lived in North America. Styracosaurus was a genus of dinosaur. "Styracosaurus" means "spiked lizard". This name was chosen by Lawrence Lambe in 1913. Styracosaurus was a member of the Ornithischia ("bird-hipped") order of dinosaurs. What this means, is that although Styracosaurus was not closely related to birds, it did have similarly shaped pelvic bones. Styracosaurus was a Ceratopsian - a member of a group of related herbivorous (plant-eating) dinosaurs with beaks, many of which had neck frills and horns as well. Styracosaurus lived between about 76 million years ago and 70 million years ago, during the late Cretaceous period. Styracosaurus lived in North America. 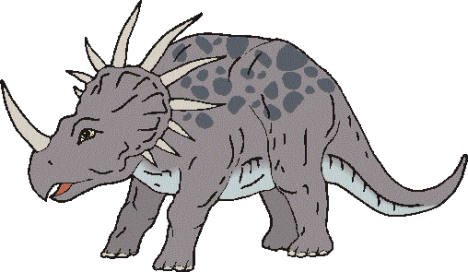 Styracosaurus was a herbivore (plant-eater). Styracosaurus was about 18 feet (5.5 meters) long. Styracosaurus weighed about 3 tons. Looks at the horned dinosaur, with information on their physical characteristics, habitat, diet, when they lived, and where their fossils have been found. Describes some of the last dinosaurs that ever lived including the Albertosaurus, the Stegoceras, the Styracosaurus, the Panoplosaurus, the Parasaurolophus, the Euoplocephalus, the Leptoceratops, and the Triceratops. It’s brains against brawn in this battle for survival. Deinonychus was a fast and wily pack hunter, but Styracosaurus had several dangerous defenses. Learn all about these interesting dinosaurs and how they may have battled each other inside. Slim Fit, Fashionable and Comfortable for Outdoor Sports. 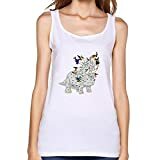 The Good Dinosaur Styracosaurus Woman Tops is made of 100% preshrunk cotton, customized design printing in the front, Eco-friendly Ink. Slim fit, fashionable and comfortable for outdoor sports. 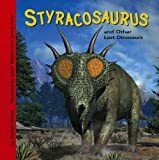 This title will help readers discover Styracosaurus dinosaurs that lived in the late Cretaceous period around 75 million years ago. Each title is complete with cool realistic illustrations, photographs of fossils, and a map of where Styracosaurus fossils have been found. Aligned to Common Core Standards and correlated to state standards. Translated by native Spanish speakers--and immersion school educators. Abdo Kids Jumbo is an imprint of Abdo Kids, a division of ABDO. A herd of prehistoric creatures comes to life on the pages of this exciting coloring book. Inside, you'll find 30 large pictures of the long-necked Apatosaurus and the mighty tyrannosaurus, as well as the ankylosaurus, stegosaurus, triceratops, parasaurolophus, and 24 other awesome reptiles. Easy-to-read captions, along with the dinosaur's name and its phonetic spelling, accompany each picture. A great way to become acquainted with dinosaurs, this exciting book will also teach you new words while you're having fun coloring. Here's a moderately priced coloring book that comes with an entertaining (as well as educational) twist! Illustrator Llyn Hunter has dramatically rendered — in alphabetical order — 28 prehistoric beasts as they might have appeared in their natural habitats millions of years ago. Extensive notes contain fascinating background information on the mighty Apatosaurus, the herbivorous Brachiosaurus, the "helmeted" Corythosaurus, and other Mesozoic creatures. Young amateur paleontologists are provided with a list of sources for further reading, plus helpful suggestions for coloring the drawings. An awesome array of long-extinct animals returns from the Age of Reptiles to introduce the alphabet. This little coloring book features 26 illustrations — one for each letter. The fun begins with the long-necked Apatosaurus and Brachiosaurus, advancing to the spotted Compsognathus, meat-eating Deinonychus, and other dynamic dinosaurs. PALEONTOLOGIST APPROVED: Working with experts from across the globe, Collecta hand-painted figurines are all factually accurate and paleontologist-approved, so little ones get to learn while they play. SAFETY: All CollectA products are individually hand crafted with only the finest materials and rigorously tested to ensure they meet the highest safety standards. CollectA authentic miniatures have been sculpted by experts in their field to achieve the most realistic and authentic look possible. Individually handcrafted in vinyl and hand-painted, these miniatures are available in a variety of sizes to fit every small hand. Designed for maximum role play fun, CollectA dinosaurs, wildlife and horses, dogs, cats and farm animals have the authentic look that kids love with the durability that parents will appreciate! These animal figures are safe, unbreakable and so realistic that they virtually come to life in a child’s hands! ONE SPIKEY SKULL: Second perhaps only to Triceratops as the most well-known Ceratopsian, Styracosaurus lacked the eyebrow horns of its cousin, but more than made up for it with 4-6 long spikes on its neck frill, and a nose horn that could measure up to two feet long! MADE WITH INDUSTRY-LEADING STANDARDS: Like all Safari Ltd products, this figurine has been individually hand painted, features quality construction from phthalate and lead-free materials, and includes an educational hangtag in 5 languages. 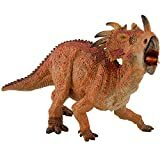 PRODUCT SPECIFICATIONS: Our Styracosaurus figure measures 8 inches long from its nose horn to the tip of its tail, and just over 3 1/2 inches tall to the tip of its tallest frill spine. It's about the size of a large index card. The figure is brown above and white below with dark green striping, and a green-and-white striped tail. Its horns and beak are raw sienna, and its frill features two large red spots. Second perhaps only to Triceratops as the most well-known Ceratopsian, Styracosaurus lacked the eyebrow horns of its cousin, but more than made up for it with 4-6 long spikes on its neck frill, and a nose horn that could measure up to two feet long! Styracosaurus could grow almost 20 feet long and weight over 6500 lbs. It lived around 75 million years ago in the Late Cretaceous Period, in what is now Alberta, Canada. It was found in the Dinosaur Park Formation. Styracosaurus was discovered in 1913 by C. M. Sternberg and named by Lawrence Lambe. Like all Safari Ltd products, this figurine has been individually hand painted, features quality construction from phthalate and lead-free materials, and includes an educational hangtag in 5 languages. Realistic, educational, and fun, this figurine is suitable for a range of interests, including collectors, enthusiasts, teachers, and kids. Admire it on a shelf, use it in the classroom, or simply enjoy playing with it. Our Styracosaurus figure measures 8 inches long from its nose horn to the tip of its tail, and just over 3 1/2 inches tall to the tip of its tallest frill spine. It's about the size of a large index card. The figure is brown above and white below with dark green striping, and a green-and-white striped tail. Its horns and beak are raw sienna, and its frill features two large red spots. Styracosaurus were stout dinosaurs that were five and a half metres long and had an impressive skull. This skull was equipped with a mighty and spiky neck frill and a nose horn of up to 50 cm in length. Note - this item was mistakenly set up with the wrong image, resulting in poor Reviews. The images are updated and concurrent these are premium quality figures. These three dinosaur figures can be posed in an infinite number of positions, providing hours of imaginative play. Dinosaurs have moving limbs and features, including moving mouth, arms, legs and wings. These 9 inch figures feature unparalleled attention to accurate scale, sculpted detail and authentic replica color. 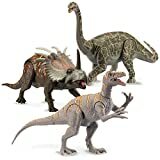 Dinosaur playset includes 3 dinosaur figures: 1) Argentinosaurus (means Argentine lizard) 2) Styracosaurus, similar to a Triceratops 3) Australovenator (theropoda) A fun and educational toy for boys, girls and toddlers! for ages 3 and up. Dimensions of each dinosaur figure are 9 x 6 x 2 inches. Colors are green, brown, red, orange and yellow. 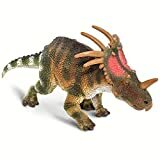 Part Of The Dinosaur Collection - This Styracosaurus is part of the dinosaur collection and it has many horns protruding from a large frill as well as the snout, posed with toothless beak agape, this dinosaur is ready to defend against any attack. This Stegosaurus in brown color does not have a jaw that opens, but it has very realistic detailing. Develops Dexterity And Sparks The Imagination - We encourage your kids to use their imagination to create their own magical kingdom. This Papo toy will help to develop their skills while enjoying hours of imaginative play in great planet's history. For almost 20 years now, Papo has been helping younger and older children to develop and to discover the world around them. Childhood is a time of dreams and adventures, and this was what we had in mind when we decided to create the first princesses, princes, dragons and Knights. Thanks to the originality of its products and the extreme care taken with product quality and safety, over the years Papo has proved popular with children and their parents. Today a reference in the world of 55020 figures, Papo continues to develop new ranges to inspire the imaginations of children the world over. In an age of mass consumption and throwaway goods, Papo remains true to its wish to produce fine toys which last over time and which can be passed on from generation to generation. 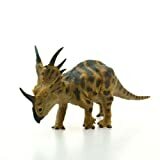 Jurassic Park collection lively strong styracosaurus decorative item can be an educational sample. Package: each piece wrapped in polyfoam and super safely packed in mailbox. 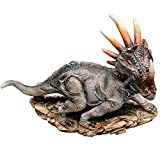 Home and office decorative strong Styracosaurus made of polyresin. This product is completely made by hand and quality is strictly checked through every production process from beginning to finishing: figurine sculpture, making mould, shaping, polishing, painting, accessory assembling, and finally quality inspection before packed in box. EDUCATIONAL - Realistic educational toy.Products are developed with the assistance of parents, teachers and children^design of our products is as realistic and naturalistic as possible. Simply the best for children. IMAGINATION - This is one of the best dinosaurs toys to give your child hours of fun and active imagination. HAND PAINTED - If you are looking for dinosaurs for children, this realistic dinosaur which is hand painted is the best choice! With a weight of 3 tons and a length of up to 5.5 metres, Styracosaurus were medium-sized ceratopsian dinosaurs, to which the Triceratops also belongs to. These dinosaurs had mighty skulls and lived in the Upper Cretaceous, which means roundabout 85 to 65 million years ago. With their giant nose horn measuring 50 centimetres and the spiked neck frill, giving its skull a massive, triangular appearance, Styracosaurus looked very robust. The function of the neck frill is still subject to speculation. It is assumed that it might have been too thin to work as a protective shield, so it might have served as a communication tool, for example as far as menacing gestures or imposing behaviour is concerned. With a weight of 3 tons and a length of up to 5.5 meters, Styracosaurus were medium-sized ceratopsian dinosaurs, to which the Triceratops also belongs to. These dinosaurs had mighty skulls and lived in the Upper Cretaceous, which means roundabout 85 to 65 million years ago. With their giant nose horn measuring 50 centimeters and the spiked neck frill, giving its skull a massive, triangular appearance, Styracosaurus looked very robust. The function of the neck frill is still subject to speculation. 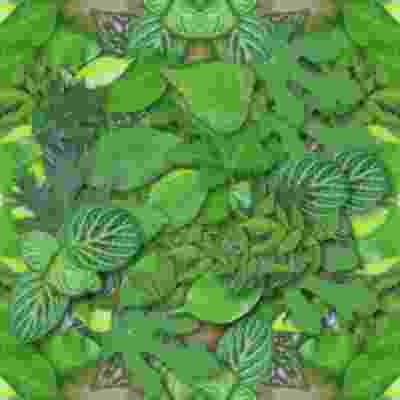 It is assumed that it might have been too thin to work as a protective shield, so it might have served as a communication tool, for example as far as menacing gestures or imposing behavior is concerned. CollectA's detailed replica of Styracosaurus is lifelike down to the texture of its skin and the horns protruding from its bony frill. The Styracosaurus is depicted in a dramatic pose as it charges forward with its mouth open and front leg lifted. The Styracosaurus was a plant eater that grew to approximately 18 feet in length and weighed up to 3 tons. It lived approximately 77 - 70 years ago. This beautifully sculpted, collectible figure from our Prehistoric Life Collection measures 3.7''L x 2.4''H. Each prehistoric figure in our collection has been approved by archeologist Anthony Beeson, a well-respected expert in paleoimagery. All CollectA models are individually hand crafted to the highest standards and made with the finest and safest phthalate-free, lead-free materials. Create a natural world in miniature with high quality toy replicas from CollectA. Our mission is to educate collectors and to provide the greatest opportunity for creative play.